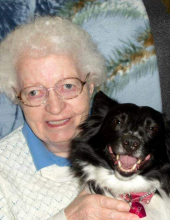 Josephine Myrtle Schultz age 87 died Wednesday January 23, 2019 at home. She was born on March 31, 1931 in Evansville the daughter of Roy and Gwendolyn (Blood) Peach. Josephine married Roger Schultz on May 19, 1956 at the Congregational United Church of Christ in Evansville. She loved listening to Blue Grass, embroidering, dancing and traveling to Nashville to the Grand ole Opry. She loved animals especially her cats and going on motorcycle trips when she was younger. She kept a orderly and neat home and enjoyed watching Soap Opera's on TV. She is survived by her husband Roger of 62 years, three children; Cindy Schultz, Stan (Victory) Schultz, Penny Holloway all of Janesville, a grandson; John Schultz-Kalas Jr., two sisters; Alice Krause, Carol Elmer, a brother; Robert Peach, several nieces and nephews. She was preceded in death by her parents, a son Timmy, a sister Joyce Peach. Funeral services will be held at 1:00pm on Wednesday January 30, 2019 at Ward-Hurtley Funeral Home Evansville with Reverend Shaun Drefahl Congregational United Church of Christ Evansville officiating. A visitation will be held from 11:00am until the time of service on Wednesday at the funeral home. Memorials are appreciated to ASPCA in Josephina name. To plant a tree in memory of Josephine Myrtle Schultz, please visit our Tribute Store. "Email Address" would like to share the life celebration of Josephine Myrtle Schultz. Click on the "link" to go to share a favorite memory or leave a condolence message for the family.